Did you know that burglaries increase approximately 11 percent during the summer months? One possible cause for the seasonal increase may be that this is a popular time for families to vacation. So what can you do decrease your chances of returning to a burglarized home after your trip? Below are the top four ways to protect your home while on vacation. Hiring or asking someone to stay in your house is one of the best ways to protect your home. Thieves look for signs that homeowners are away. By having someone live in your home, your house is less likely to give the green light to burglars. 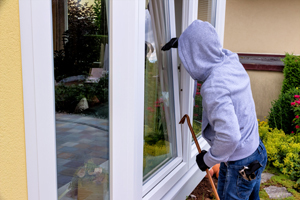 It might seem like a no-brainer to lock your doors and windows before leaving for vacation, but there are other entry points on your home that might be less obvious to homeowners, but favorites for burglars. Remove any spare keys you might have hidden, and give these to a trusted friend or relative in case of an emergency. Turn off your garage door opener to prevent a thief from using a universal remote. Don’t forget to lock upstair windows and back doors. If you decide not to hire a house sitter, there are other ways to protect your home while away and eliminate signs that you are away. Request that the post office hold your mail and ask your newspaper company to pause delivery so that these do not pile up and announce your absence. Cover garage windows so that burglars cannot see whether or not your car is inside. It is also a great idea to ask a neighbor to park in your driveway while you are on vacation. Invest in motion-activation devices and timers for lights, indoors and outdoors. Set the timers to periods when you are usually home, to avoid thieves noticing a difference in the pattern. Avoid another tell-tale sign by waiting to post information and/or photos of your trip to social media until after you have returned. Even though you might have your privacy settings on, there is still the possibility that a potential thief could see your posts and know that it is an opportune time to break into your home. Leaving your GPS visible in your car is also another give-away that you will not be home. A thief could steal your GPS and it could lead them directly to your empty home. Even if you do not own a security system, advertising that you do can deter a potential break-in. Think about adding a sign that states you own a security system, or even a “Beware of Dog” sign to your property. Of course, having a working security system is preferable to just pretending that you do. Before you leave for vacation, call your security company to notify them that you will be away. A less expensive solution may be to purchase a safe to store valuables. Place the safe in an unlikely place, such as a child’s closet. Another option is to store valuables in a safety deposit box with your financial institution. Our experienced team is here to help if you notice a break-in during vacation. Contact one of our skilled attorneys 24/7 for Results You Deserve®.